Pinkadots Elementary : Manic Monday & Getting ready to celebrate!!! Manic Monday & Getting ready to celebrate!!! Do you see that? Over there...on the right??? Those are all my blog friends, are you one of them? Since we started this blog in January, we never thought we would reach 100 followers. Now that we are almost there, we are SUPER excited and want to create a SPECTACULAR giveaway for you! If you would like to help us celebrate, please fill out the little form below. I will get back to your by Saturday (4/13)- (as long as I can figure out how to find the results!) Thank you SO much for helping us out and THANK YOU to all of our followers! 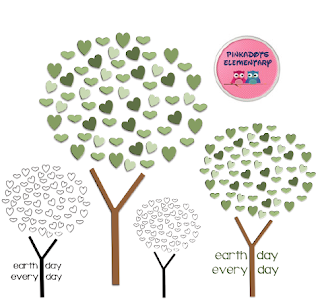 I am SO excited to share my "lovely" Earth Day trees with you. I absolutely love how these heart trees came out. 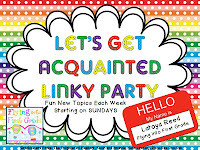 Included in the freebie are 4 PNG graphics. I made them in color, black & white, with words, and without. They will look great on any papers and can even be used as a coloring template. If you love it as much as I do, please leave me some feedback and let me know! :) I'd love to see what you use it on! Oh yeah, we almost forgot our friend, Latoya, at Flying into First Grade! #1. My laptop (with unlimited Internet and battery). #2. Sunglasses (I have blue eyes that are very sensitive to sun). #3. My husband (he can hunt, fish, cook, and protect me....awwww). I made my Earth Day set already, but I'm thinking I may need to add something new with these adorable trees! Thanks! I am your 98th follower...congratulations on being so close to 100! I just started blogging this week, but I have been reading blogs for quite some time now. Just found your blog today and its very cute, great job ladies! I love how you added another 3!